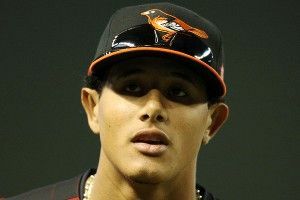 The Baltimore Orioles shocked the baseball world, announcing they’ll call up 20-year-old mega-prospect Manny Machado in time for today’s game against the Royals. It’s a shocker given Machado’s age and experience level, not to mention there being no hints or rumors leaking out of Baltimore that such a move might be imminent. Machado was the third overall pick in the 2010 draft, and kids two years out of high school rarely make it to the big leagues, much less play in a pennant race. We’ve had one 20-year-old dominate in his first run as a full-timer in the Show. Machado has posted decent but not dominant numbers at Double-A Bowie, hitting .266/.350/.431, good for a .358 Weighted On Base Average. He’s also expected to start at third base for the O’s, which is interesting given he’s a shortstop prospect who’s played just two minor league games at third. It’s still worth the damn gamble. The Orioles haven’t had a winning season in 15 years, which is also as long as it’s been since they’ve made the playoffs — only the Pirates’ 20-year sub-.500 drought has been longer. They’re now sitting in a three-way tie for the AL’s top wild-card spot. They are where they are thanks to their unfathomable success in close games: 22-6 in one-run contests, and 12-2 in extra-inning games, including 12 wins in a row. Some of that can be attributed to a terrific bullpen. If you’re feeling generous, maybe you toss some credit to manager Buck Showalter, or some kind of special fortitude that the 2012 Orioles might possess. But really, it’s tough not to point the finger at luck. And in baseball as in life, luck can be both fickle and fleeting. What the Orioles surely do have is a deeply flawed roster. Brian Roberts is out for the year, leaving journeyman Omar Quintanilla to try and smoke-and-mirrors his way through the rest of the season at second base. Left field is being split between Nate McLouth, a banjo hitter designated for assignment in May by the Pirates who just got called up Saturday, and Lew Ford, who went five years without a hit in the majors before finding a second life in Baltimore at age 35. The starting rotation’s been patched together with paper clips and glue, a motley crew of mound MacGyvers. The Orioles own the ninth-worst run differential in the majors, allowing 511 runs and scoring just 464. Perhaps most terrifying of all has been Baltimore’s corner infield defense: Wilson Betemit’s one of the worst glovemen in baseball at third, and Mark Reynolds gets to look clumsy every day at first, only because he was an absolute nightmare at third. The O’s obviously believe Machado will be a major defensive upgrade, given he was capable enough to handle the toughest position on the diamond — even if he’ll be learning third base on the fly. It’s not clear that Machado at this age can (or will) hit right-handed pitchers better than Betemit has. He’s shown a solid approach for someone so young, with 47 walks against 70 strikeouts in 455 plate appearances. He’s also improved as the season’s gone on, leaving Bowie with a nine-game hitting streak in which he went 16-for-33, with three homers, three doubles, and two triples (hat-tip @masnSteve). It’s possible that Machado falls flat on his face. In a worst-case scenario, it’s even conceivable that a premature call-up messes with the kid’s head and hurts his development, a potential disaster given Machado’s talent and projected role in the team’s future. But that latter possibility’s fairly remote, and top prospects can and often do benefit from being challenged and facing elite competition. The Orioles are finally, amazingly, in a pennant race. Their best position-player prospect has a chance to give them a lift. Might as well go for it.